This Demonstration shows nets of eight icosahedron stellations. 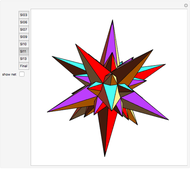 Coordinates of polyhedra were calculated using Great Stella . 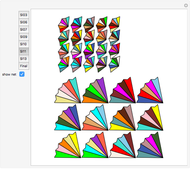 In this program, there are 17 stellations (the icosahedron is not counted). Our notation, for instance SI06, means the sixth stellation in this sequence. Complete sequence of the stellations is available in . R. E. Maeder, The Mathematica Programmer II, San Diego: Academic Press, 1996. R. Webb. "Great Stella." Software3D. (2014) www.software3d.com/Stella.php. Izidor Hafner "Nets of Some Icosahedron Stellations"